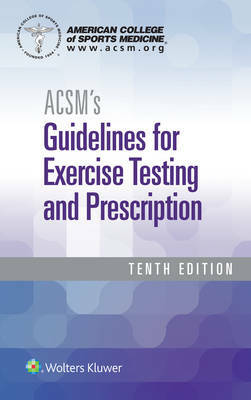 ACSMs Guidelines for Exercise Testing and Prescription is the flagship title from the American College of Sports Medicine, the prestigious organization that sets the standards for the exercise profession. This critical handbook delivers scientifically based standards on exercise testing and prescription to the certification candidate, the professional, and the student. This manual gives succinct summaries of recommended procedures for exercise testing and exercise prescription in healthy and diseased patients The tenth edition reflects some crucial and exciting changes, making the content necessary for effective study and practice. New pre-exercise health screening recommendations are critical to helping more of the population begin a safe, healthy physical activity program without consulting a physician.